Even if you have never had New Zealand brewed beer, you likely would have tasted the essence of the place when drinking brews from giants like BrewDog, Sierra Nevada and Green Flash. The country’s hops are famed across the world for their flavours and aromas, described as anything from "tropical fruit salad" to "post-coital armpit". Our Man in New Zealand, Jono Galuszka, heads to Motueka in the country’s South Island to find out how a horticultural crisis created some of the world’s most unique hops, what scientists are doing to bring new flavours to your next pint of pale ale, and what the part-owner of an NBA team has to do with any of it. A thick fog hovers over the white New Zealand Hops warehouses. You can't see it, but it’s there. It hits you as soon as you pull into the parking lot. It fills your nostrils before you step out of your car. Dank, sweaty, fruity. This is the smell that makes brewers and beer drinkers across the world go weak at the knees. If Willy Wonka was into beer instead of chocolate, New Zealand Hops would be his home. A freezer as big as a hardware store has bales of hop flowers stacked from floor to ceiling. A similar sized freezer houses processed hops. 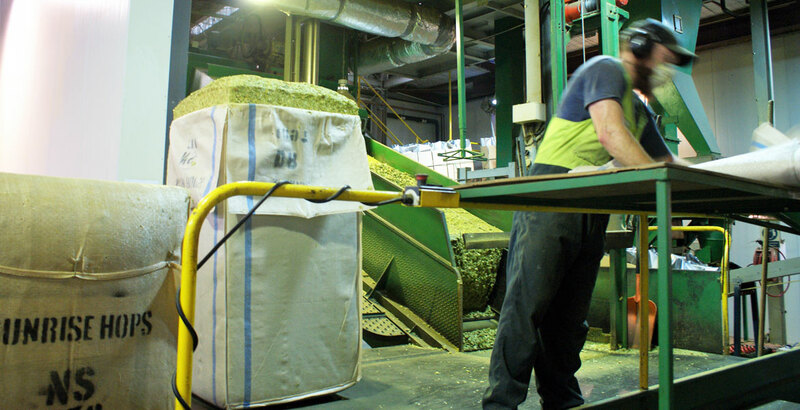 Off to the side, workers take these bales and turn them into lime green coloured hop pellets. It’s enough to bring out the Augustus Gloop in all of us. 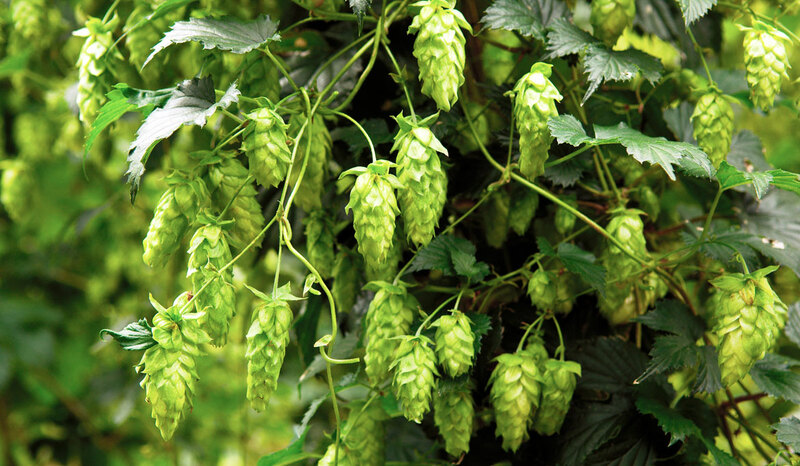 New Zealand Hops, a cooperative owned by hop growers, is the guardian of this hop-dusted wonderland. 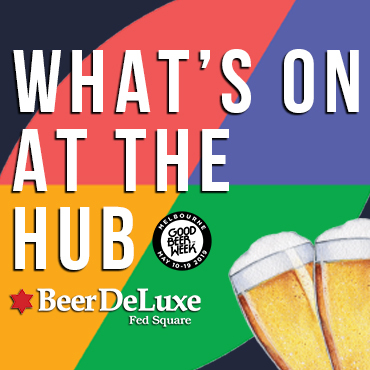 The middleman between those growing hops and those brewing with them, staff at the Nelson business turn fresh hops into products like pellets and liquid extract, then make sure they get to where they need to go. 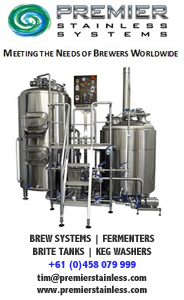 They are also responsible for importing most of the American and European varieties New Zealand brewers use. Financial controller Steve Wilson (pictured above right) says the company acts as an important conduit between brewers and growers. That often means delivering bad news to brewers – “Sorry, they cannot grow any more Riwaka”, for example – and growers making tough decisions, like ripping longstanding hop varieties out of the ground to ensure they can keep up with current brewing trends. But these are exciting times at New Zealand Hops. Seven new growers are joining the cooperative, adding 300 hectares of growing space to the 420 hectares already available. Steve says many of the new growers come from other primary industries, like dairy or blackcurrants, and their decision to change should take projected hop harvests from about 750,000 kilograms a year to north of 1 million. However, Steve is quick to temper expectations of a glut of Nelson Sauvin and Motueka – two of the most in demand hops, which make up about 40 per cent of the harvest. That game has changed a lot for New Zealand Hops in the past ten years, thanks to the growth of craft beer. Combined hop usage from New Zealand craft brewers is now outstripping that of the Big Three (Lion, DB and Independent), which Steve says has shifted focus directly onto delivering hops with aroma and flavour over bitterness. It's similar to the changes at Hop Products Australia, where they are growing ever greater volumes of varieties like Galaxy, Ella and Vic Secret, or Ellerslie Hop, where they still grow older Australian varieties like Pride of Ringwood but have released fruitier, juicier newcomers like Astra and Melba too. Managing demand has been tricky, says Steve, and now sees about a dozen New Zealand craft breweries contracting their supply of specific varieties like Riwaka – a notoriously difficult hop to grow, but especially coveted for giving beers a massive passionfruit and grapefruit aroma. The worldwide movement toward more flavour-driven beer is another thing driving New Zealand Hops in certain directions. Steve says they're aiming to get out of the “commodity market”, which could see some products, like cans of hop extract, culled. The company is now all about providing niche products, supplying a small part of the worldwide market in a way no other market can. 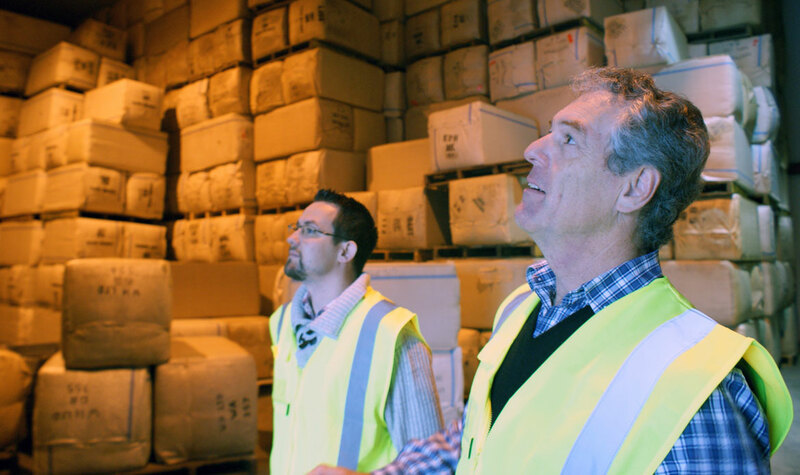 It is a conversation everyone involved in New Zealand’s primary industries is having, as the country looks to hit a government target of doubling the sector’s export value by 2025. There is only so much land, so everyone, from dairy farmers to hop growers, is trying to figure out how to get more money from their patches of dirt. But all the big talk in the New Zealand hop scene is about the newcomers. 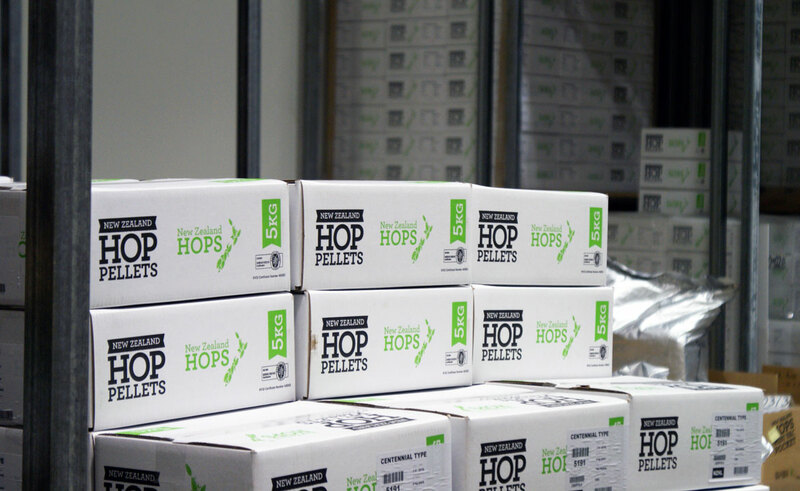 There have been rumours abounding for years about someone in Auckland trialling a hop farm, while Hopsteiner started importing containers of its hop varieties into New Zealand earlier this year. However, the biggest news concerned Bruce Eggers, whose family has farmed hops since the early 1900s, selling his 119 hectare hop farm for $9.8m to Michael Stone – an American venture capitalist who has stakes in interests as diverse as Fender Instruments, Uber and the Sacramento Kings NBA team. Fairfax Media reported in April that Stone’s company, FS Investments, purchased the farm after hearing how hard it was for brewers in San Diego to get their hands on New Zealand hops. New Zealand Hops's structure, that of a cooperative, gives it a number of advantages, says Steve, not least strength in numbers. It also helps insulate against risk – if one farmer has a bad year, the other farmers will still be producing varieties to cover the gaps. But key to New Zealand Hops staying ahead of the game has been its relationship with Plant and Food Research, a Crown Research Institute involved in figuring out how to get more value out of fruit, vegetables, crops and food products. There, you find the scientists who helped create Nelson Sauvin, Riwaka, Green Bullet and every other New Zealand hop you will find in a beer made by your favourite brewer. 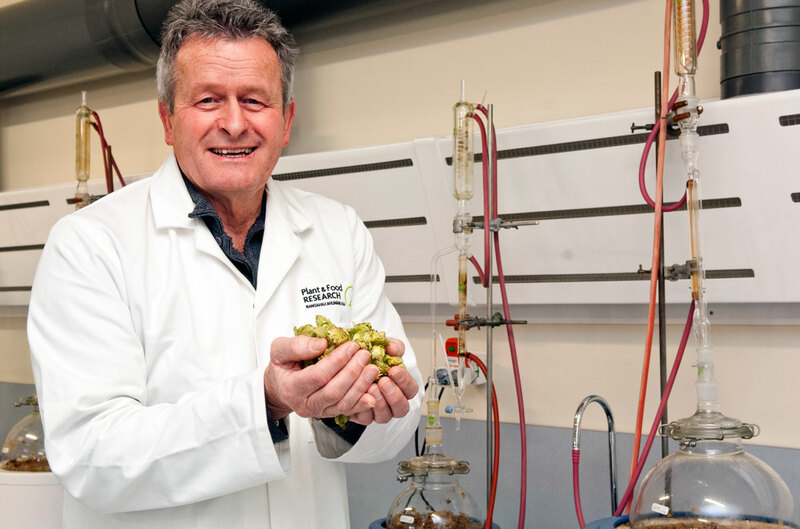 Ron Beatson (pictured below), known by those in the brewing industry as Dr Ron, is the main man behind Plant and Food’s hop research programme, leading a team of five on the ever-evolving quest to find the next big thing in hops. But, as he explains, the mission was less about discovery and more about survival when the programme started just after World War II. The key scientist at the start was Dr Rudi Roborgh, whose work is recognised in the most honourable way possible – the hop variety Dr Rudi is named after him. He got on top of the disease side of things quickly by splicing European disease-resistant hop genes into the American variety already grown in New Zealand. The New Zealand scientists were then the first in the world to create triploid hops. The science is dense but, in summary, triploid hops do not grow seeds, which can impart off flavours to beer. But, above all, what beer drinkers love about New Zealand hops is the aroma and flavour, something Ron says has been the research team’s focus since the 1970s. Ron has been part of that journey since the 1980s and was directly involved in the creation of New Zealand hop rockstars Nelson Sauvin, Motueka and Riwaka. The focus, however, is very much on the future and finding the next rockstar. He says they create 3,000 different seedlings every year. That’s 3,000 potential new hop varieties. But the process of getting from there to your glass of IPA is a long one, taking upwards of eight years. So how does Ron know he has a banger? Genetic testing of new cultivars, then comparing the DNA against existing varieties, only gets him so far. That’s where Plant and Food’s pilot brewery, commissioned in 2016 thanks to a government funding contract, comes in handy. Ron will brew small batches of golden ale, with the experimental hop varieties crammed in via a hopback and dry hopping, and send the bottles out to industry experts like New Zealand Hops chief executive and former Malt Shovel head brewer Doug Donelan. If they like what they taste, then it’s off to commercial trials. Superstar New Zealand hop variety Motueka. A hop being trialled at the moment, which Ron believes is ready to go out to all and sundry, is nicknamed Waimea’s Sister. Genetically similar to Waimea, the sister has been given to Wellington’s Fork and Brewer and Eddyline in Nelson, among others, to try out. The Eddyline beer made with it throws out sweet pineapple and citrus, and finishes with a remarkably smooth bitterness. Working with the brewing industry is high on Ron’s agenda as he has a “bubble” of new hops to try. Plant and Food’s government contract, worth NZ$650,000 a year, also requires him to get more of the industry involved. That’s how Garage Project ended up making their Hop Trial series. It also enabled them to make 2016 fresh hop beer The Amazing Hop Boy, which featured 63 different hop varieties. One would think Plant and Food was a highly valued asset in New Zealand’s brewing crown, considering it drives one of the country’s most innovative manufacturing industries. Yet Ron says money is a key issue. There's some industry funding, but Plant and Food’s government contract, which fills most of the research budget, ends in 2019. He is hoping more government funding will come, but doubts it will come from the current source – the Ministry of Business, Innovation and Employment – as it is putting less focus on funding for developing crops for export. But the situation isn't dampening Ron’s desire to get among brewers and hop growers. “You’ve got to keep challenging yourself and seeing where you can improve," he says. "For me, I like nothing better than getting out, smelling hops, sampling beer or being out in the paddock.